Not everyone has a laundry room with lots of space. Personally, we have a laundry closet, with a small linen closet. The laundry used to spill out in the kitchen (not a good look) until we turned the linen closet into laundry storage space. I don’t know about you, but in my house, dirty clothes have a tendency to end up tossed as far as humanly possible from the laundry hamper. The kid gets home from school and socks are in the front room or I find a cloth used to wipe something down in my office. Of course, it falls to me, and all of our hampers are in the bedrooms upstairs. Even worse, come laundry day, the laundry was sorted and piled on the kitchen floor. Not a good look. I prayed that no one would visit that day. After I finished organizing the pantry a few months ago, I knew that the laundry situation would be my next organizing project . And that brings me to today’s makeover! I have an awkward and tiny laundry room that sits between the garage and the kitchen. Our little laundry room had a broom closet that just wasn’t being utilized to its fullest potential. Do you ever have those moments where you just can’t take the mess any longer? That was me…and so I enlisted my husband to help me build some shelves in that closet, pronto. I put two rails on each side with enough space between to hold the laundry baskets. The rails consisted on scrap wood we had lying around. We cut a white laminate shelf to appropriate size to make 2 shelves for the laundry closet, and placed them on top of the rails. *I always feel the need to state this, but the house wasn’t in good shape and that is what all of the walls looked like when we moved in. Actually, that is better than some. Of course, I wanted the closet to also look nice! I choose wallpaper because I felt it would hold up better to scrapes and dings. I absolutely loved this damask print and there are tons of reasonably priced, fun prints. I purchased two rolls, but I was about a foot short. I left that area at the very bottom shelf so no one will ever notice it. Well, now you will, lol. Good job, calling myself out. 3 large baskets to hold clothes that can also be taken upstairs to fold. I wanted to keep the wire rack so I could hang a few small things like bras. I don’t dry sweaters or anything like that in here though. So happy to have a place to store the laundry ready for the washing machine. And it is pretty too! I plan on putting a sliding door in, but that is a project for another day. 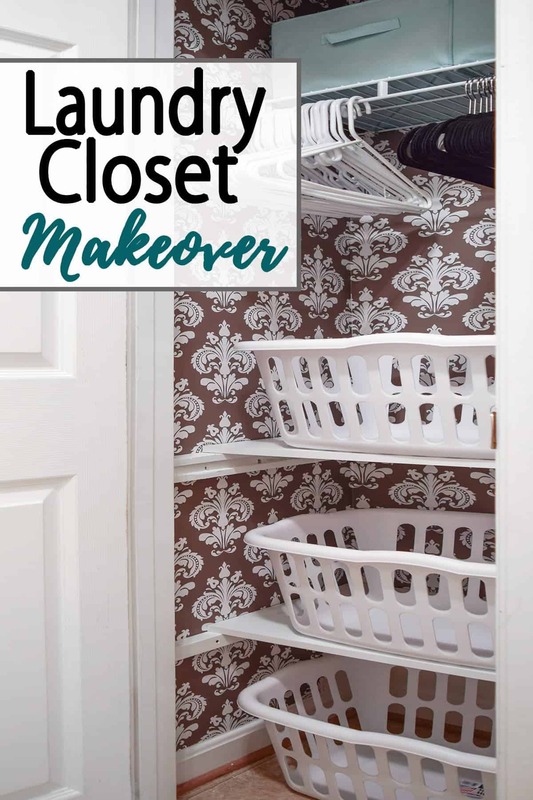 I hope you enjoyed this little laundry room closet makeover! Small Bathroom Organization – Maximize that space! The idea is fabulous and I have been wanting to set something up with like this. My closet is small like yours so I am wondering what you did with your brooms and mops that were in there before? Thank you for your help in this matter!! Yes, I had a problem with that as well because the only other closest we have is a tiny coat closet that I have the vacuum and hats in. Right now the mops and broom are hanging on the garage wall just next to the laundry room door. Our laundry room is positioned as a breezeway between the garage and the kitchen. It is terribly tiny and I am actually installing shelving and a cabinet in it today so I will probably post it in a few weeks or so. Someday, though, I intend to build a closet in the foyer to store the cleaning supplies and vacuum in. I love your updated Laundry Closet. Thank you for sharing at the Thursday Favorite Things Blog Hop! Take time to to visit my site where I featured you at my Tuesday Treasures round up. Hope to see you at the party tonight! This is freaking awesome! thanks for sharing at Pin Worthy Wednesday! I love it Rachel! So creative! Your laundry room looks fabulous. I love the wall paper. I have a small laundry closet too. I don’t kn ow who came up with the idea of placing a laundry area in the kitchen. In my opinion is very odd. I have to pile dirty laundry on my kitchen floor. Not cool at all. Right now…I am working on trying to make it a little more pleasant. I have a top load washer so…it makes things a little more difficult. The only extra space I have found is a place to put my broom and mop using a neat little gadget that I found. Having the water closet in there also makes things awkward, I think you have come up with a great solution for your laundry dilemma. Love it!! Great job. I bet you smile everytime you use it now 🙂 I know I would. Thanks for sharing with us at the Brag About It Link Party! This is terrific! I love your wallpaper choice too. Organization always makes me smile. Hugs! oops the word” is” is missing from my comment, sorry..it was apparently eaten by gremlins…LOL this is terrific! haha! I fixed it for you. Those terrible gremlins! Wow! What a huge difference and it looks AMAZING. I just love the wallpaper and the pull out baskets. Come do my closet! lol! I hate sorting laundry. We are a family of seven and it’s just not fun to sit and dig through mount washmore every few days. Get two baskets or hampers per person and put in their closet. Darks in one, lights in the other. Wash when a hamper has enough for a full load. No more sorting laundry before cleaning and no more sorting after, either! Because all that laundry coming out of the dryer goes back to one single bedroom. Oh, the times I held congress in the living room, sorting through a basket half full of items nobody would claim – over! Gosh, I couldn’t imagine sorting laundry for seven and keeping track of it all. I laughed till I snorted at holding congress in the living room (because I’ve been there too). That idea about the baskets is brilliant! Now if I can only figure out how to get everyone to empty pockets. I find pens, belts still on pants, legos, and surprises all the time. Awww, thanks Winnie! I love it so much too and have gotten so much use out of it the last few months.